Fans of Cassandra Clare’s Shadowhunter Chronicles books are in for a real treat on Tuesday, March 8. Not only does that mark the release for Lady Midnight, the first book in Clare’s new Dark Artifices series, but it also kicks off the Lady Midnight tour in Los Angeles. And guess who will be making a special appearance? The cast of Shadowhunters. 1) I’ve updated my tour dates page with hopefully, all the events I’m doing in the USA in March, and my tour of the UK/Ireland in April. A lot of the events are ticketed – the one in London already sold out – so grab tickets and find the info here! 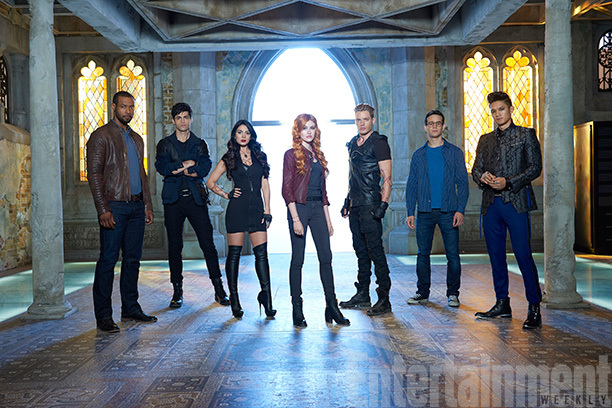 2) Why the Shadowhunters TV art? BECAUSE, as I just found out, the Lady Midnight launch party event in Los Angeles will be welcoming as special guests Dominic Sherwood (Jace), Kat McNamara (Clary) Emeraude Toubia (Isabelle) Harry Shum Jr (Magnus) and Isaiah Mustafa (Luke.) So delighted to have them! They’ll be there to say hi and to take part in the Q&A so you can ask them any burning Shadowhunters questions you desire. And admire Emeraude’s shoes because they’re always stellar.